The first night home game for the Cardinals had two unintended consequences: It prompted the dismissal of their manager and led to a ban on serving beverages in glass bottles. On Jan. 31, 1940, the National League Cardinals and the American League Browns agreed to share the $150,000 cost to install lights at Sportsman’s Park in St. Louis. Stupp Brothers Bridge and Iron Company of St. Louis was hired to do the structural work and Westinghouse Electrical Supply Company was given the job of putting in the reflectors and floodlights on eight steel towers. Eleven nights later, the Cardinals got their first chance to play under the lights at home. On June 4, 1940, 23,500 spectators turned out on a Tuesday night to see the Cardinals open a series against the Dodgers. The Cardinals had a 14-22 record and owner Sam Breadon was becoming increasingly impatient with manager Ray Blades. Seeking a sharp, winning performance before the large crowd in the club’s first night home game, Breadon saw just the opposite. The Dodgers scored five in the first against Mort Cooper. Disheartened by the debacle, Breadon made up his mind to fire Blades, The Sporting News reported. The announcement of Blades’ firing came three days later, surprising general manager Branch Rickey, who hadn’t been informed by Breadon of the decision. Billy Southworth, managing the Cardinals’ minor-league club at Rochester, was Breadon’s choice to replace Blades. Breadon also announced the Cardinals would use paper cups instead of bottles for serving cold drinks in the Sportsman’s Park bleachers. 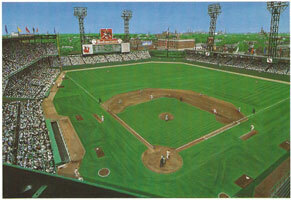 The 1940 Cardinals played seven home night games, winning three.